Claremorris “The Heart of the West” is centrally located in both Mayo and Connacht: an ideal location for touring the West. It is situated half way between Sligo and Galway on the N17 road. Claremorris is a small town, population 3,900. Being small, it is a friendly and intimate place where people know each other and will welcome the stranger and make them feel at home. It is only 20 minutes from Ireland West Airport Knock, 3 hours from Dublin and about 4 hours from Cork or Belfast. It is a good place for Family or Senior Citizen holidays. 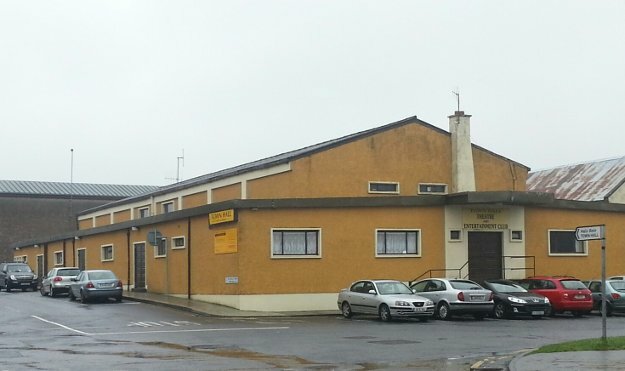 Claremorris Town Hall Theatre was built in 1969 – the first dance was held on June 20th 1969 – and has been a vital community resource ever since. 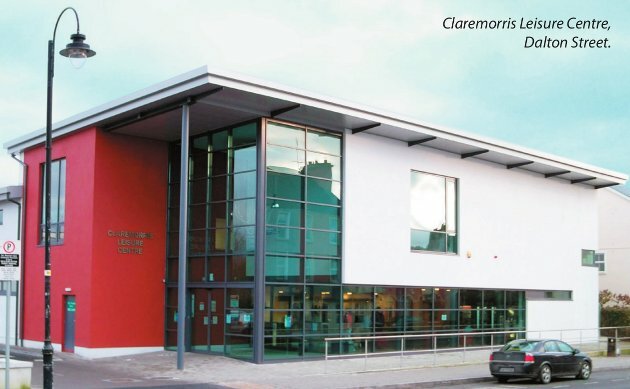 The first Claremorris Drama Festival was held in March 1971. 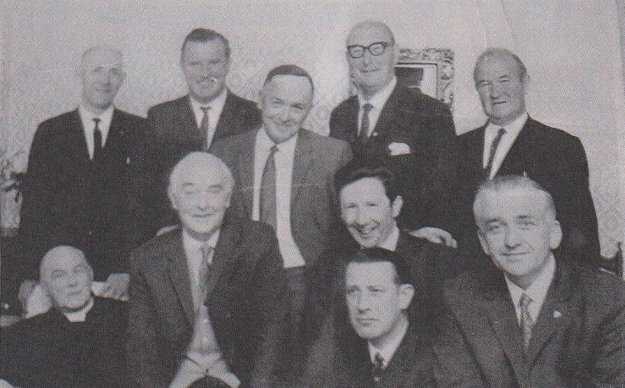 Back Row:LtoR: Seamus O’Malley, Arthur Hanley, P.J. Brennan, Pat Merrick, T.H. Kean. Front Row:LtoR: Monsignor H. Curley, P.P. Dr. J. F. McHugh, Ml. Prendergast, Ml. J. Reidy, Paddy O’Brien. See the map below for the location of the Town Hall Theatre in Claremorris. There are Hotels, B&Bs, Self-Catering Apartments and Houses and an excellent Hostel in or near the town and surrounding area. (Max. car journey 15mins). Three of the hotels are in Claremorris and three more are within 15mins drive. Several of the B&B’s are Fáilte Ireland (Tourist Board) registered, while some are not but they offer a good service. Hotel Options in Claremorris and surrounding areas. 4* McWilliam Park – Our premier contemporary hotel offers 103 elegantly furnished rooms complete with leisure centre facilities. Located a few minutes walk from the Town Hall. Make sure to mention Drama Festival to avail of a special room rate. 3* Dalton Inn Hotel – Full of old world charm. Perfectly located in the town centre, it will make the ideal base to enjoy your trip to Claremorris, A 2 minute walk to the Town Hall and home to our wonderful Fringe Festival and Festival Club. Hurry rooms are limited, so book early to be in the heart of the action. 3* Knock House Hotel – A warm welcome awaits from this 68 bedroom hotel is located in the pretty holy shrine village of Knock a 10 km drive from Claremorris. 3* Park Hotel – Modern spacious hotel offering 46 contemporary rooms. Again this hotel is in the neighbouring town of Kiltimagh a 13km drive from Claremorris. 3* Ard Ri Hotel – This modern hotel offers 51 stylish rooms thus guaranteeing satisfaction. 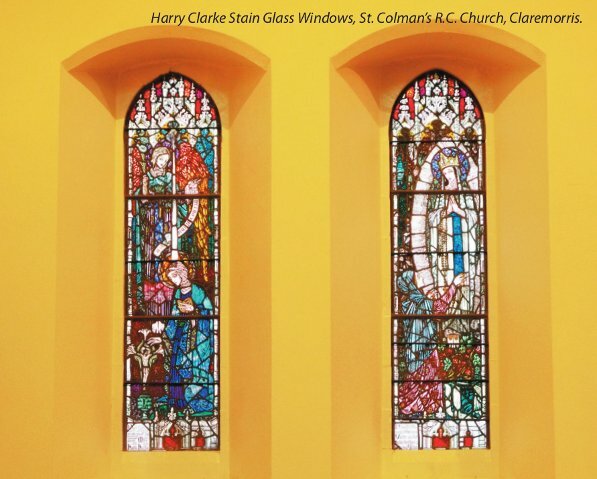 Located on the edge of Tuam, Co Galway its on 24km to Claremorris. “Summerhill” B&B – Experience a warm and friendly welcome in this family run property. Set in a quiet cul-de-sac its just 5 mins walk from the town hall. “Oakdale” B&B – Let Carmel & Tom Ansboro welcome you to there elegant and beautifully restored Victorian Guest house. Set in 3 acres on Convent rd, convenient 7 min walk to the Town Hall. “Ashlawn” Cora & Basil Judge extend a warm welcome to their B&B just a 10 min walk to the town hall. Set on the edge of town with beautiful views over Clare Lake, and you can avail of lovely walks in the adjacent McMahon Park. Conway’s B&B – Where Carmel & Pat will look after your needs with true Irish Hospitality. A 5 min drive takes you to Claremorris town hall. Bean an Ti – Chrissie Moran can offer a group 4 rooms in her home, located 7 min drive from Claremorris in the lovely village of Crossboyne. Bridileen O’Malley B&B – Bridileen’s B&B is based in Ballinrobe (13 miles from Claremorris). Railway Lodge Apts – Situated on the edge of the Town, a mere 5 min walk to the Town Hall. 1,2,& 3 bedroom spacious & modern apts, ideal for anyone wishing to do there own thing ! Also can offer Hillview House located in Knock 10kms away. Valley Lodge Hostel – For a unique experience this accommodation includes both Farmhouse B&B and a Farm Hostel. Situated on a working farm a short 10 drive from Claremorris. Perfect option for the budget conscious Drama goer. There are 28 Food Outlets in or near Claremorris: these range from full evening dinner to lunch, to snacks, to fast food to take-aways. Food served in pubs (called “pub grub”) can be very wholesome and relatively inexpensive. Menus vary. Not all pubs serve food. Check it out before you check in! The Old Arch Bar and Bistro, James St. Provides a served lunch and evening dinner. The McWilliam Park Hotel, Kilcolman Rd. Provides carvery and evening dinner. The Dalton Inn, Dalton St. Provides carvery, evening dinner & accommodation. Clay model paint and glaze. Sit down meals. Indian, Thai & European – Opens evenings ‘til late. Stay or Take Away. Thai & European. Stay or Take away. Chinese. Stay or Take away. Lunch till 4.00pm & evening meals. Good value, fresh, home-made food all day. Cill Aodain Hotel, Kiltimagh. 15 minutes. Supermac’s & Papa John’s Pizzas, Dalton St.
Fast food: stay or take away. Open late. Claremorris Golf Club, Ballindine Road. Serves full lunches. Closes at 6.00 pm. O’Hehir’s Restaurant & Bakery, Silverbridge Shop. Centre. Breakfast, light lunches, snacks, fresh baking. Closes at 6.00pm. Light Lunches served. Open 8 am to 6 pm. Val’s Fish & Chips, James’ St.
Late & Early, Ballyhaunis Road. Hillside Filling Station, Ballyhaunis Road. Prize winning victualler and delicatessen. The IRD Office (Tourist Info Point) is on the Ballyhaunis Road. The Train Station is off Main St. and Mount St. (see map). Here you can get a train, directly or indirectly to any part of Ireland. Time tables are posted outside and you may get a free copy inside. The Bus Stops are in D’Alton St. Timetables are published there. You are advised to agree the price of your taxi or minibus before journey commences. The Catholic Church is on D’Alton Street. Sat. Vigil Mass: 7.00pm. Sun. 11.00am. The Leisure Centre (Swim Pool, Gym etc.) is on D’Alton Street. The Health Centre is on the Old Knock Road. After hours there is a doctor on call from ‘Westdoc’. The number for that day is recorded on the above doctors phones. See brochure in IRD/ Tourist Info Office. This totals to a 5km walk. The Golf course is approx. 5 minutes drive out the Galway Road. Hanley’s Equestrian Centre is approx. 5 minutes drive out the Galway Road. The Kiltimagh Pet Farm is 20 minutes drive. The Graune Pet Farm: is 25 minutes drive. Pots of Fun (indoor for smaller children) is in Lakeside Shopping Centre. Clay Café is in Lakeside Shopping Centre. 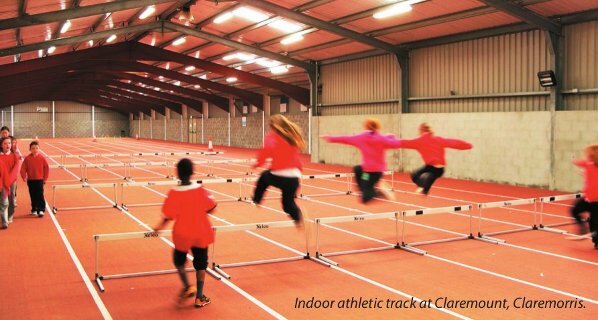 Indoor Athletics Centre is at the junction of Kiltimagh and Castlebar Road in Claremorris. It is 5 minutes drive from the Town Square. There are several Playing Fields for GAA & Soccer. The Barnacarroll Sports Complex (indoor) is 8 minutes drive out the Knock Road, N17 North. Claremorris Golf club was formed in 1918 and its first course was at Claremont later known as “The Race Course” near the Castlebar/Kiltimagh road. Later, in 1962 ground for a 9-hole course was acquired from the Land Commission when they divided up the Lord Oranmore & Brown estate. In 1996 more land for another 9 holes was purchased and a magnificent 18-hole course was designed by Mr. Tom Craddock and opened in 1998. Its greens are to USGA standard, sand-based and amongst the best in Ireland. So, today Claremorris Golf Course is an 18-hole, par 73, championship, parkland course, 6,131 metres long over hills, streams and lovely soft grass! This pleasant course takes you over several bridges, in between ponds and trees (some of which jump out in front of your ball at times!!). Visitors or full time members are welcome. Green fees are €20 to €25 and, while it is essential to phone for reservations, availability is generally good. There are Golf lessons available for both adults and children. Special thanks to Pat Walsh, Linda Connolly and Ml.J.Reidy for their contribution to the content in this guide to Claremorris.